Tatiana has been part of Bay State Physical Therapy team for 11 years. Tatiana is a Massachusetts native, and received her Bachelor of Science of Finance from Northeastern University. After graduation, she lived in Puerto Rico for a year where she worked as a staff accountant for a Radio Station. Upon her return to Massachusetts, Tatiana decided to go back to grad school where she received her MSA/ MBA from her alma mater, Northeastern University. Tatiana is also a Certified Public Accountant (CPA). 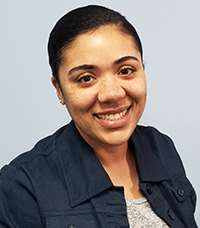 Tatiana sits on the Board of the Stoughton YMCA and likes to listen to different podcasts, including The Moth, A Way with Words, Freakonomics, Hidden Brain. In her free time she enjoys singing, cooking meals for family and friends, volunteering at her church, family road trips and listening to Kpop with her kids. Tatiana is also a proud finisher of the 2015 Boston Marathon.